Unable to form any new memories due to contact with a spatial anomaly, Archer finds himself in a dismal future. In the teaser, Archer wakes up in his quarters in the middle of a battle without a clue of what's going on. He rushes to the bridge to find T'Pol in a Starfleet uniform, commanding the bridge and watching as a massive Xindi weapon points a beam directly at Earth. The weapon activates, and the molten core of the planet splits Enterprise's home apart as it expands and eventually explodes. The viewer is left staring agape at the screen thinking... "Oh, goody! A time travel episode!" Yes, they just did that! They just blew up Earth! Which means, since Kirk still has a home in Iowa, there are only two possible explanations: 1) time travel or 2) fantasy world. 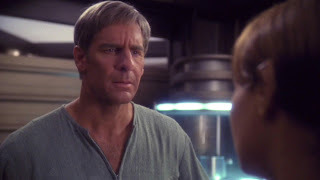 And when Archer wakes up in a small human settlement living with T'Pol who explains to him everything that had happened for the past 12 years, it becomes clear that somehow time travel is going to be involved because no one goes through that much trouble to create detailed flashback scenes for a fantasy world. The last thing that Archer remembered was saving T'Pol from a spatial anomaly that was wreaking havoc on the Enterprise. The anomaly got to him and left him with interspatial parasites in his brain's hippocampus that made it impossible for him to form long-term memories. Faced with the debilitating ailment, Archer was deemed unfit for command and T'Pol took a field commission. However, if Star Trek has taught us anything about Vulcans, it's that they make terrible captains. The only logical course of action is to activate the self destruct. In the flashback sequence, Trip mentions that since T'Pol has taken command, the Enterprise has taken one wrong turn after another. 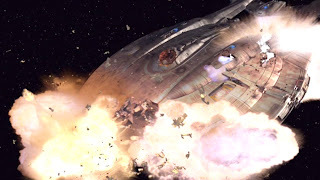 They had failed to find the Xindi superweapon and when they came close, they fell under attack from Xindi Reptilians who severely crippled the ship and went on to deploy the weapon anyway. On the bright side, though, they killed Travis in the attack. T'Pol tells Archer that after they destroyed Earth, the Xindi went on to find every human settlement in the galaxy and hunt them down. What little of humanity remained banded together under the protection of the Enterprise to settle down on a far-off planet. Also Archer and T'Pol are now married? The whole 12 years, Phlox has been working on a cure for the interspatial parasites in Archer's brain. Apparently there's a lot of quantum physics involved since the parasites are able to dip in and out of dimensions. But, after consulting with the finest doctors and physicists on Denobula, Phlox believes he finally has a cure! A subspace implosion would do it, but that would, obviously, kill Archer. What Phlox needs is high enough energy directed directly into Archer's brain. And in order to do it, he needs to hook Archer's brain up to a warp engine... and the only warp engine around is on the Enterprise. Back on board his old ship, he meets with Trip, who is now in command of the vessel, and Reed, who has taken command of another ship and now sports a beard, and Hoshi who is... older? Phlox does a test round of the treatment and finds it successful. One cluster of parasites is gone. Now, I know what you're thinking: "Where is time travel coming into play!? What about Earth!?" Well, here's where it starts. Apparently, since these interspatial parasites exist not only outside of space, but also outside of time, when they get rid of them in the future, they also disappear from the past! When Phlox got rid of that one cluster, the same cluster disappeared from Archer's previous charts! So, you know what this means: they get rid of all the parasites, cure Archer, and time resets! T'Pol doesn't become captain and Earth is potentially saved! Well, it figures that's the time when the Xindi choose to attack. Apparently they had hired some guy to follow Phlox and now they know where Earth's last outpost is. With all of Enterprise's energy needed for battle, Archer's treatment is put on hold. And the battle does not go well. Trip is able to ambush some of the ships at first, but ultimately the bulk of the Xindi force concentrates power on Enterprise's bridge and rips the roof right off of it, killing everyone inside. The only hope for humanity now is to get the parasites out of Archer's brain. But Phlox's instrument has been destroyed. So what else can destroy the parasites? A subspace implosion. This can be achieved by modifying the warp core, but it would destroy the ship and everyone on it as well. Not that it matters... they've lost the game. As more and more Xindi board the ship, Archer gets to work with Phlox and T'Pol's help and eventually... kaboom. The interspatial parasites now gone, Archer awakes 12 years earlier the day after saving T'Pol from a spatial anomaly in the sickbay in an entirely new timeline with no more than a slight concussion. It's too bad, really... I would love to have seen T'Pol screw everything up. Well, there are a few nerdy time travel physics concerns, most notably how this particular time travel mechanic meshes with the mechanic seen in Star Trek (2009) as well as how Phlox and T'Pol even remember that there was a cluster if they erased it from time, but this is nit-picking. Overall, I loves myself a good time travel episode as well as a good alternate reality episode! And this was just that! We now know exactly what would happen if the Xindi were successful. Now let's watch them fail.